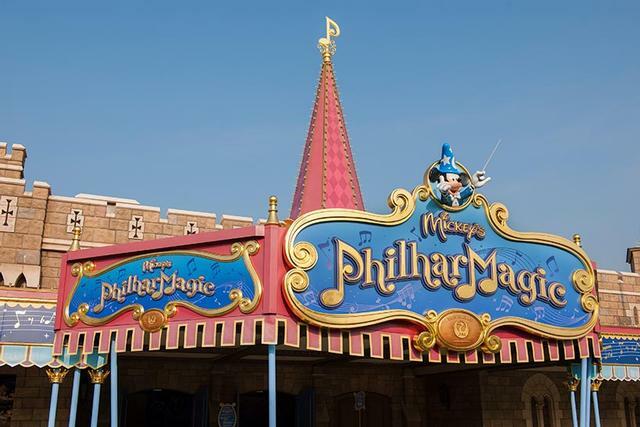 Mickey's PhilharMagic is a movie in Fantasyland at Tokyo Disneyland. While it's not the best, it is also recommended. Despite the "Mickey's PhilharMagic" name, Donald Duck gets the most screen time and attention in this musical adventure through classic Disney moments, though, as always, it is up to Mickey to put everything right when Donald goes out of control. This is one of my favourite attractions in all of Disneyland. It seems like "merely a movie" but it's so much more. The music from the Disney films is excellent. They have turned classic Disney characters into 3D (like little mermaid, Lion King, Alladin), and they emphasize the 3D aspects very well. The story is fun and integrates some of the best of Disney's movies into it. The 4D aspect is pretty cool (water spray or smells, etc). The ending is really funny. This attraction really has it all. I would say that no trip to Disneyland is complete without it.